• Removal of existing bathroom fixtures and disposal of flooring debris. • Installation of 4-piece Aquatic A2 tub/shower unit with Delta tub/shower faucet in chrome. • Ceramic tile flooring and matching tile baseboard. • 24” custom-made vanity with granite/quartz counter top. • A Delta 4” spread lavatory faucet in chrome. • An American Standard Edgemere Comfort Height commode. 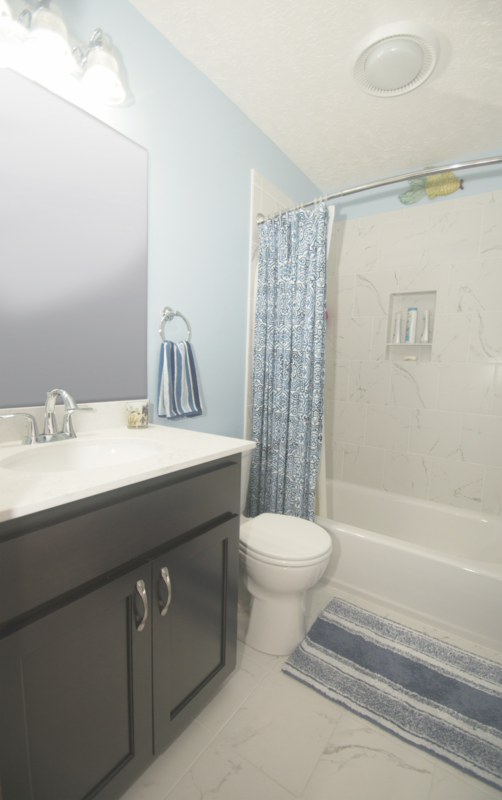 • New vanity light and replacement of existing exhaust fan w/ 80 cfm and a recessed light. • Drywall will be repaired as needed. Walls painted with 2 coats of Premium Benjamin Moore paint. *Exclusions: Must be 5’x8’ bathroom; Tub opening must be 60”; No wallpaper; No tile wainscoting; Recessed light not included if no existing fan/light combo; Subfloor must be in good condition; Existing drywall must be in good condition; Low payment options available with approved credit.